I have been really fascinated lately (and pretty much for life, actually), with the concept of stories, their impact on us when we read or hear or tell or write them, their importance for history and culture, and how they function on large and small scales. As I say in our “About” page, stories are all around us, and they constantly inspire me. Recently, a high school student I was tutoring asked me why people even began to write in the first place, or how did writing even become a “thing,” as he put it. I told him that I had some ideas, but didn’t know for sure, and we spent a few minutes brainstorming on the board. Some of his answers included “bad memory,” “art,” “religion,” “accident,” “fun,” and “boredom.” I was highly amused by his list, and a favorite of ours was “bad memory.” It seemed like a pretty viable option, that writing could come about as a way of helping keep track of life so as to prevent forgetting. We both agreed that photos and facebook are largely serving that purpose for us now (for him more so than me), although writing is very important, and feels different from imagistic storytelling. Through those electronic means, which can become virtual and visual “timelines” or representations of life’s moments, we can not only share our lives with friends, but we are reminded of our happy memories and significant events. I could go on about the possible detriments of social media platforms for record keeping, and the short term and long term memory loss that our culture seems to be experiencing as a result of reliance on technology, but that might be too much digression, even for me (I tend to ramble and diverge when I tell stories). As you might imagine, my answers when we were brainstorming was slightly different, and more long-winded. Some of them included teaching future generations about lessons learned during previous ones, exploring the strategies, successes, and failures of others, and for storytelling purposes. I have always loved listening to stories, and telling them. It’s probably also apparent that I enjoy reading, since I have discussed it on Looking for Pemberley fairly frequently. I was having a conversation with my friend not too long ago about my interest in stories. For me, I think that my love of stories comes from the feeling of relating to others, of understanding more about myself and people in general after reading. I’m a social person, I’m interested in people. Stories are generally about people, their growth, reflections, lessons, and interactions. Stories are living, and they also teach us how to live. They are influenced by the culture and historical moment of their time, but when they last (as when they are written and future generations read them), they can be interpreted by each individual reader, changing not only with each person, but also with each reading. For example, I have read Pride and Prejudice many times over since the first reading, but it feels different each time. It becomes different because of my perception, and the novel feels different for each reader, despite the words staying more or less the same as they were over 100 years ago. A dear friend of mine recently told me, after I told her that I had an undying love of stories, that “of course you love stories. I live for stories, to hear the stories of others, and to tell my own. That is the greatest pleasure in life.” I certainly agree. Her beautiful words inspired me to write this post. Writing, to me, probably began as a way to make stories last for as long as possible. I am thankful for the ability to read works from years in the past because of the development of writing and its varied progressions. Whatever the real “answer,” I’m glad we have writing, because stories can be read and re-read, changing with each reading, and serving as a time capsule of sorts for the “bad memory” of the authors who write them. Please forgive the crude drawing style. This is my first attempt at a comic. Thanks to all the bloggers and authors I read for sharing your stories, and if you would like to tell me a story, or share your view on stories, please do. I’d love to listen and live. 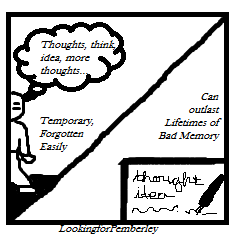 This entry was posted in Observation and tagged Artwork, comics, history, humans, Looking for Pemberley, Reading, Stories, Storytelling, teaching, tutoring, writing. The art of storytelling, in whatever form, written or otherwise, is practiced for so many reasons. As entertainment and as a way to teach morals; to remember the past and to dream for the future. To make sense of ourselves and the world we live in. The construction of a narrative is what makes us human and we all do it whether we are “writers” or not. Thank you for your fabulous comment. I especially love your last point about our humanity, and I absolutely agree. I love reading because I learn so much about the human spirit. And technology has an important role … Using it anyone can create a social role as a storyteller. We can connect with people on a global scale through our blogs. Thanks for coming by mine. I would never have found you and your wonderful writing otherwise! Thank you for your comment! I do agree with you. Although I have been very hesitant to embrace technology, I am learning so much about other people through their blogs, facebooks, and other social media sites. I do feel best when I take some breaks away from those outlets, but I believe you are right. I hope you return and join in our conversations more! I love this post. There is definitely something elemental in writing stories. My nine-year-old son seems to have an instinctive need to write stories, while his younger siblings still make up random songs all the time, which I suppose are stories too. I feel much more alive when I am writing, and I am loving getting back to it after almost a decade of immersion in babies. Welcome! And congrats for returning to stories! I’ve always held the ability to lie convincingly and the ability to tell a great story to be almost directly proportionate. Not to take away anything from writing, but its time we acknowledged that it takes just as much (if not more) imagination to lie credibly. Ha ha! Your comment cracks me up. Thanks for sharing! I would say that I think that part of the idea of credibility (Ethos) in itself does exclude lying, but that is my classical education coming out of the woodwork. I think lying is very very difficult, but I do see the connection. Interesting point. I enjoyed reading this. In fact, it was a pleasure, and I shall return to read more. I find that we both share a genuine appreciation of reading, writing, and storytelling. Thomas, great to hear your feedback! I hope you do visit again! Happy Valentine’s Day to you as well! I completely agree with everything you’ve said here, and although I’m a bit obsessive about my Facebooking, there’s nothing like curling up with a great book. They give us and teach us so many things that movies and the internet simply can’t. Thanks for sharing your passion with us! Thanks for your detailed feedback, and please come back! I recently read this quote from Salman Rushdie and he has such a simple, beautiful way to explain what writing is and what we use it for. I thought I’d share. Wow- so grateful for this. Thanks so much for sharing! Lovely post. When I work with high school students I often hear similar remarks – how sad to think of world without written words…and sound bytes instead of stories! Thanks for sharing & happy writing! Dunno, but suspect writing came first out of mundane commerce and spread to other uses…specific communication became general communication. Story-telling, song. poetry preexisted writing, I suppose and absorbed and enlarged it when it became available. There were bards before there were alphabets…and their art didn’t have to die with them anymore. so writing is a shot at immortality, too. A fellow traveller, I think, LFP. I enjoy your blog a great deal. Stories to me are life carried about in a handy format, to be dipped into for remembrance, instruction,wishfulness, etc. I also think when one is called to write, one is prepared to dip a lot deeper into the well of human existence on this Earth, and be a messenger on a multitude of levels not all of which are in this active reality. I cannot not write. The Trilogy and its prequel began as three lines scribbled on a notebook, but now 17 years later I could build a house with the paper I covered. There were no shortcuts, only a deepening of the process when i caught up to what was going on. Enough already! One of the cheapest addictions I know!